No, I am not going to tell you that chalk paint is bad! They are made from a heavy plastic. 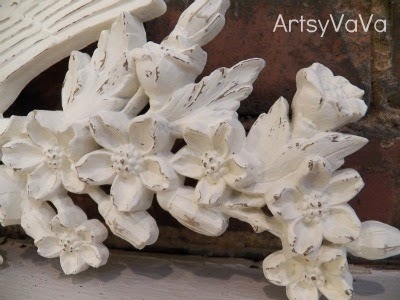 And, yes, you can paint plastic with chalk paint. Using a wet paper towel, I rubbed the high spots to antique the plaques. 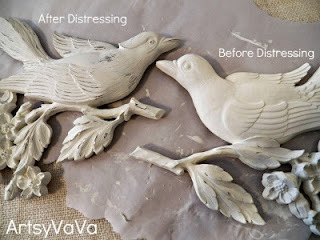 See...chalk paint really is for the birds! 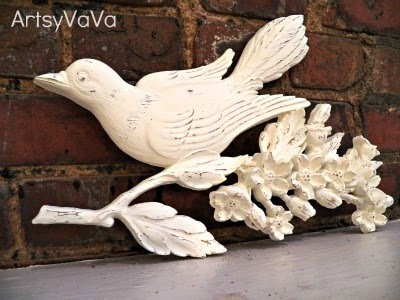 Well, I didn't know that you could use chalk paint on plastic! Wow! Your birds turned out great. OMG! 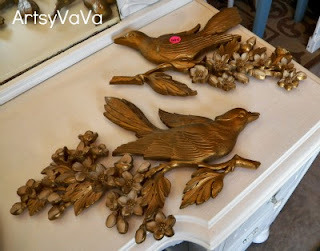 I bought those same birds at a thrift store a few weeks back. I was going to spray paint them, but now I'm going to try chalk paint! Thanks for sharing! Love it! There's a few things I could use that on in my house to give them a new life. Thanks! Can you use chalk paint and then have them outdoors, like on the brick wall in your pic? Hadnt heard of chalk paint before, am assuming its a white version of blackboard paint? Must investigate it.....can see possibilities for its use, so thanks for the heads up about it! How have I not heard of it!! This chalk paint is pretty awesome - and I love the extra step of making them distressed. Good investment at fifty cents a pop! Beautiful results. Nice! 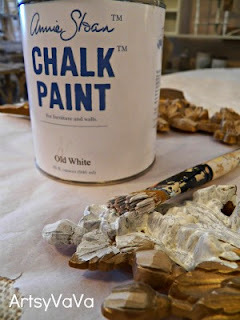 I would love to give some chalk paint a try. Came over from Thrifty Thursday to see the birds. I have a giant gold plastic frame that I have been wanting to paint, but was not sure which to go. Thanks! Everything old is new again! Love it! 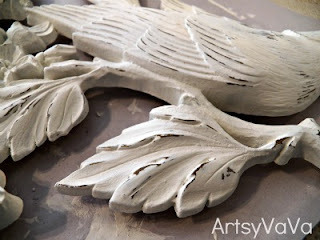 Fun use for the chalk paint--I have just started playing with it--love it! What a great idea thanks for sharing! http://iheartpears.blogspot.com. I'll be back soon! WOW! I would never have believed that is the same bird from the before picture. It looks so pretty! I bought a gold plastic ornate mirror at a yard sale and this would be great for it! Thanks! Love them! 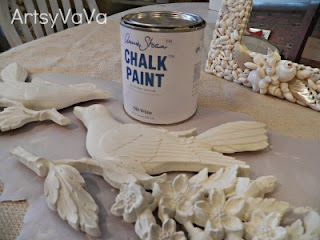 I have been mixing my own chalk paint and using on plastic wall candle holders. It's great to cover with isn't it?! Cute! Thanks for linking to Things I've Done Thursday! I have painted a golden plastic mirror frame, too! How gorgeous! 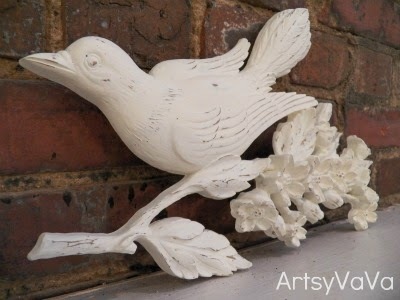 I just love the colour, it really brings out the bird plaque!! So lovely! I recently purchased Graphite and to paint a piece of furniture. Can't wait to start! yay! 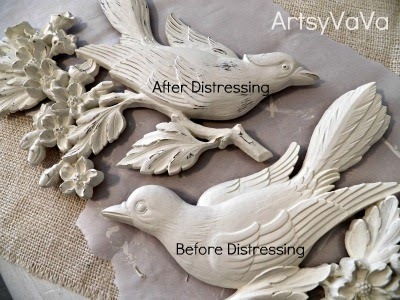 I have those exact same bird plaques, just waiting for an inspired redo, and I now I found it -- thank you!! 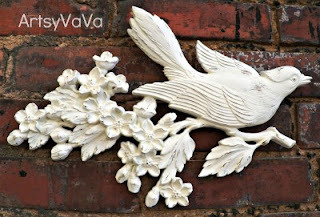 I've been puttering around with how to decorate a bland brick wall on my patio...these birds with my newly-painted turquoise iron furniture will be the start of something beautiful. Wow! Thanks for sharing that the chalk paint will stick to plastic...I didn't know that. 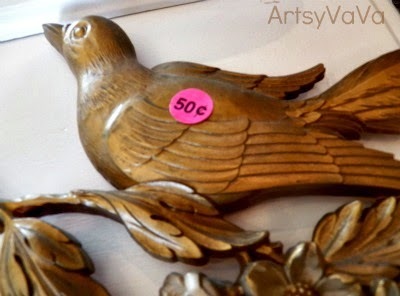 Your artistic touches with the distressing really are what make them look old and expensive. Great job! I saw your post over at "Funky Junk Interiors". Aren't you clever to think of using chalk paint to transform those little birds into beauties! 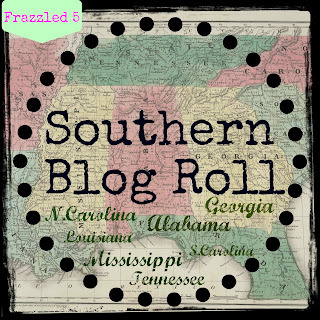 I'm your newest follower from Blissful & Domestic Sunday Blog Hop! Love your blog. It would be great if you would follow me back at http://lifeofblocks.blogspot.com/ Thanks!! 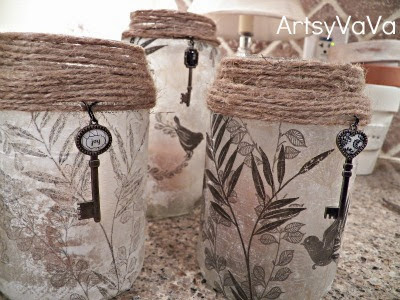 I totally agree with you :) These are so pretty -- what did we ever do before chalk paint??? beautiful ;)) Very very lovely..
Holy cow, it is amazing how great the transformation is. I no longer look past that plastic "Home Interiors" stuff at a garage sale. That's really cool! I had no idea you could chalk paint on plastic. Thanks for sharing! really a neat way to update something we all walk past at garage sales. Now I'm going to stop at ones I would normally drive by just to see if I can find some cheap things to paint. Great job. Gosh, those plastic birds turned out great! The birds are something I wouldn't have given a second look, but you turned them into something beautiful! Way to go! Wow how impressive that plastic birds can look that good! Thanks for sharing with us at Link It Up Thursday. these turned out so pretty, Virginia! I definitely am featuring these today. thanks for sharing. have a fab weekend!